You are curenlty in Alimed To2te® Walker Oxygen Bag, For E Tank made by Alimed and asigned to category. 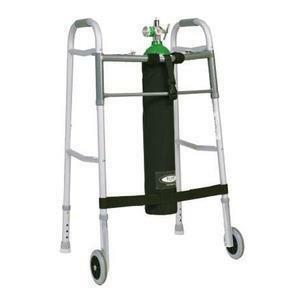 Walker Oxygen Bag Helps To Attach An Oxygen Tank To A Wheeled Walker Or Wheelchair. Sturdy Hook And Loop Straps. Attaches To Most Walkers With Quick, No-Tool Installation. Easy To Insert And Remove Oxygen Cylinder. You have selected Alimed To2te® Walker Oxygen Bag, For E Tank from Oxygen Equipment. We hope that this Alimed To2te® Walker Oxygen Bag, For E Tank made by Alimed is what you were looking for. If you have any questions about this particular Alimed To2te® Walker Oxygen Bag, For E Tank or any other products from Oxygen Equipment, please call us. We have an experienced staff that will gladly help pick out the correct Alimed To2te® Walker Oxygen Bag, For E Tank for you, also. If you are looking to make a purchase of Alimed To2te® Walker Oxygen Bag, For E Tank in large quantity or you are a Hospital or Medical facility and need help on making a purchase of Alimed To2te® Walker Oxygen Bag, For E Tank made by Alimed, please contact us.